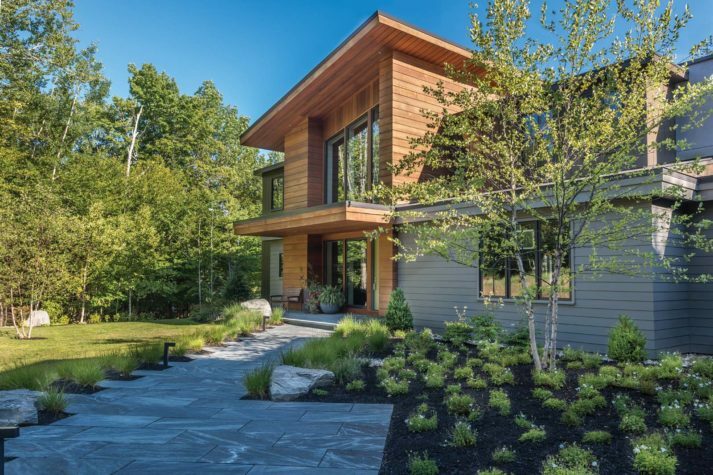 A contemporary home on the shore of Harspwell mixes material and textures to create an earthy hideaway in the trees. The owners’ suite bedroom looks out at the water. The homeowner decided to paint her bedroom a soothing shade of light blue. “This color reminded me of the outside sky. It’s cool, but there is a tiny bit of warmth to it,” she says. The paint is by Sherwin Williams, and the chair is from Room and Board. 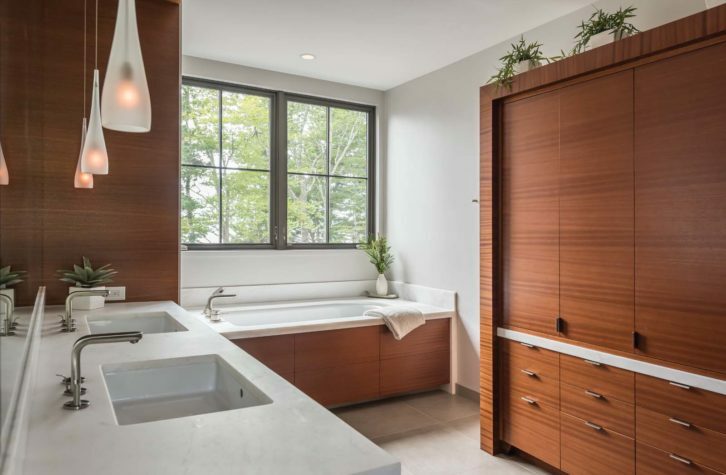 The owners’ suite bathroom features white marble and built-in cabinetry. 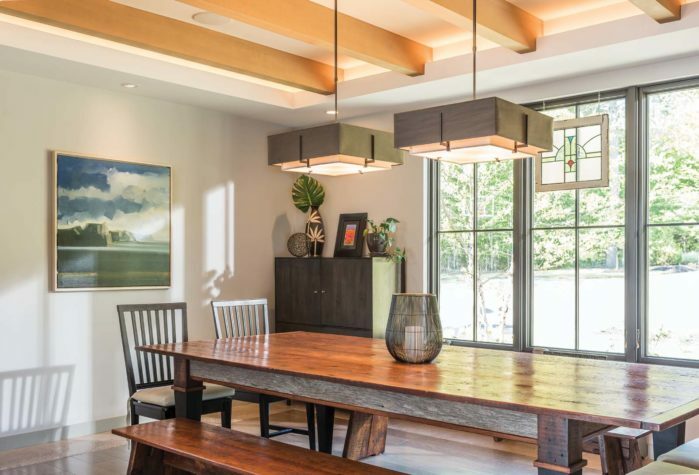 This custom-built dining room table is made from reused floorboards taken from an old house in Bath. The painting on the wall was purchased during a family trip to Iceland. The owners briefly considered putting in a pool but opted for this hot tub instead. 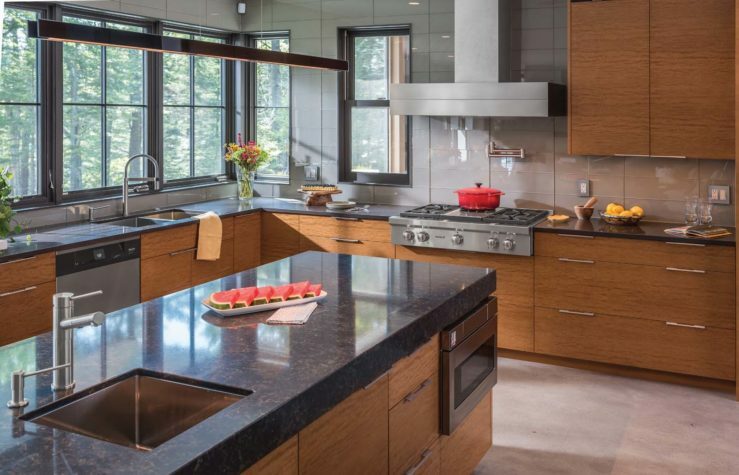 Black quartz countertops pair with stainless-steel fixtures to create a sleek, contemporary kitchen. 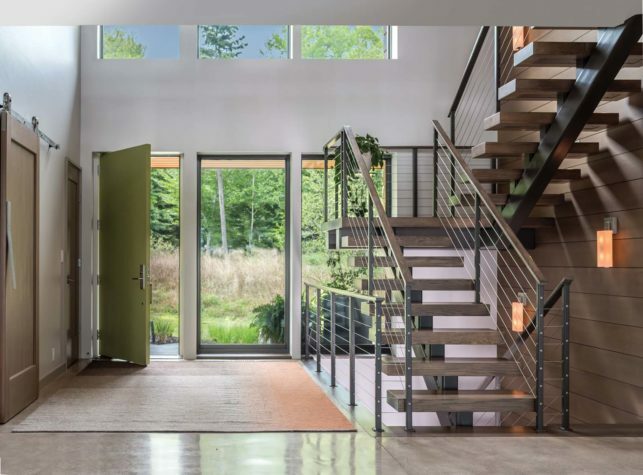 “Green is a color that really matched the outside world, and I wanted to bring a pop of color to the inside,” says the homeowner of their distinctive front door. “It felt like a real green, one you would actually find outside in nature.” Rug from Crate and Barrel. 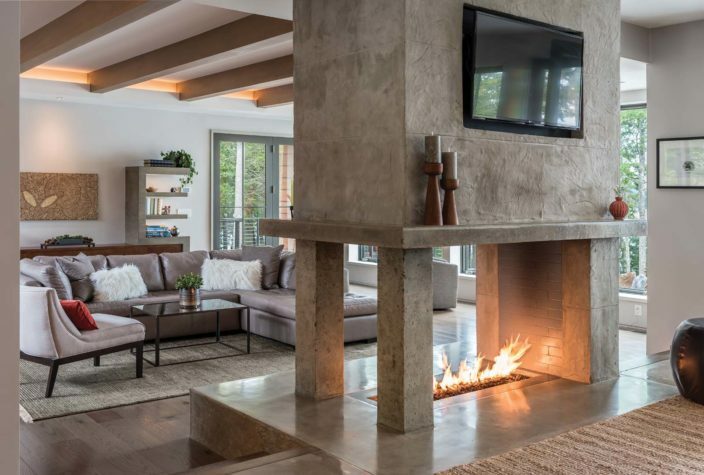 The gas-powered fireplace separates the open-concept living room, dining room, and kitchen. The homeowners use the built-in dining nook in the kitchen for quick and informal meals. 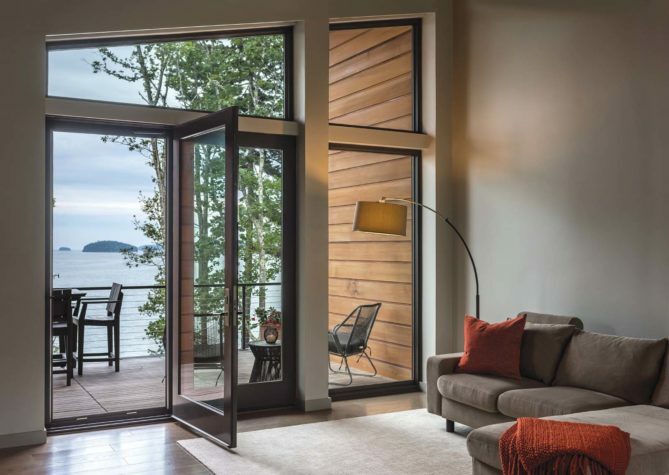 “The fireplace creates enough separation that each area downstairs feels like its own distinct sphere,” explains architect Rick Nelson. “At no point does it seem like an echoey, overwhelming, or too-big space,” adds designer Brady-Anne Cushing. For two weeks, they put the project on pause as Nelson drew and redrew designs. When construction started again, everything had changed. Sure, they had the same basic foundation and floor plan, but the overall look and feel had shifted dramatically. The traditional roofline was replaced with a series of horizontal lines that rise like a staircase behind the trees. 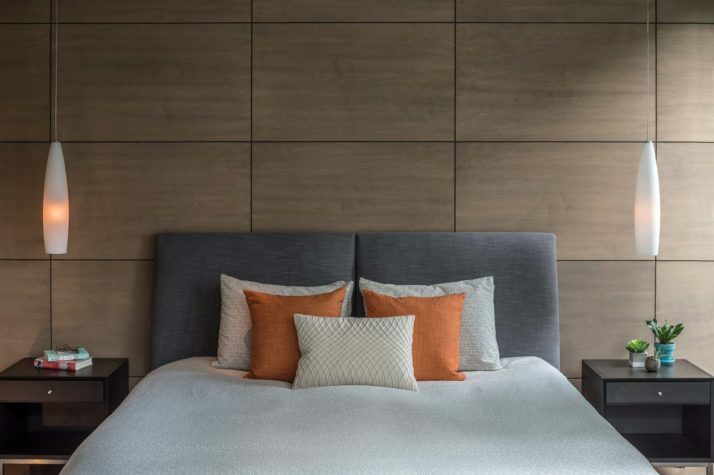 Instead of shingle or clapboard siding, they were using a mixture of gray-painted wood panels and sheets of concrete, offset by some sections of clapboard siding and other areas of board and batten. There is nothing fussy or ornamental about Tide’s Ledge. Instead, it looks as sleek and sturdy as a harbor seal. But her hands-on approach paid off. 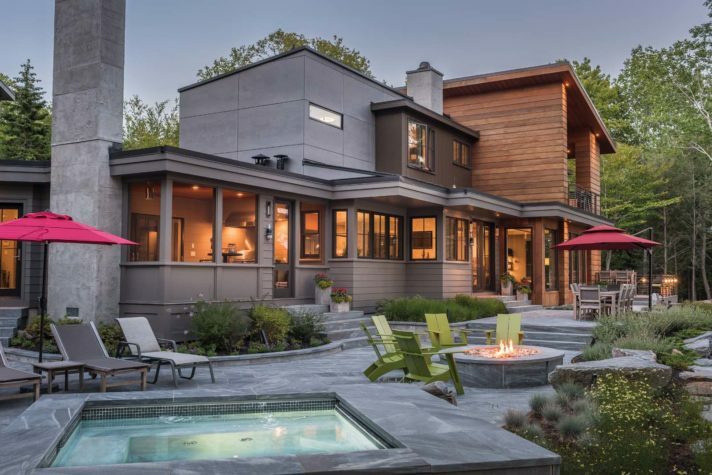 She, Nelson, and interior designer Brady-Anne Cushing, also of Knickerbocker, created a cohesive house that feels right at home in the forest yet includes all the creature comforts one could want (including an outdoor hot tub, several gas fireplaces, and a fully kitted-out kitchen). “It was really designed for our needs,” says the homeowner. “We plan to live here until we can’t.” And, should the day ever come when climbing stairs no longer works for the couple, they know exactly what they’ll do: add an elevator that goes from the basement level to the top floor, running through the center of the house. “We planned ahead,” she says. The homeowner can’t pinpoint her single favorite space in the house because, she says, they use them all differently. The upstairs is where she and her husband retreat to the privacy of their big corner bedroom and en suite bathroom. They have two walk-in closets, a living area with a television, and a second apartment for guests (including their four adult children). In contrast to the intimacy of the second story, the first floor functions as a more public area. The downstairs living room is great for entertaining, with its low, comfortable sofas and soft, neutral-hued rugs. Yet it’s a perennial truth that the kitchen is the heart of the house and the focal point for every good party. “I wanted an open kitchen, living room, and dining room so that it would be easy to mingle,” says the homeowner. “I went through every single detail of that kitchen because it was so important for it to be user-friendly.” She wanted a large island where she could do prep work and a small built-in sink for rinsing vegetables. 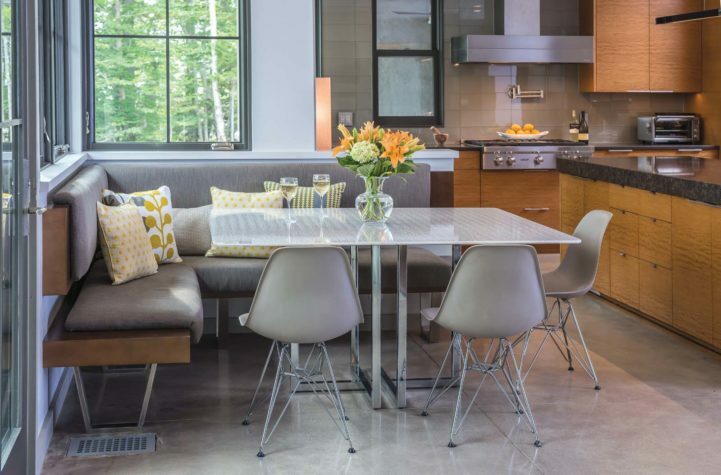 Instead of adding stools, the couple decided this area would be standing-room only, which helps encourage guests to move from one space to another. 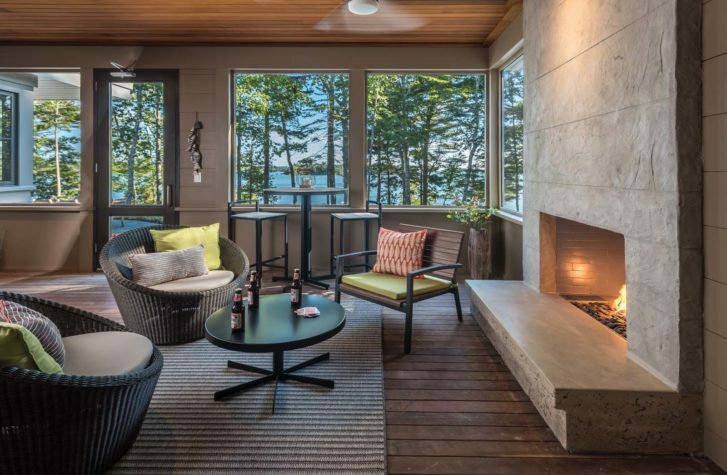 After stopping to gab with the hostess at the kitchen island, they can grab a drink at the bar by the dining area and wander into the living room to look out at the islands as they sink into the fog. They achieved this effect by using a variety of natural and man-made materials, united by their similar colors and tones. Even though they used five different types of wood, including fir, oak, maple, cedar, and an African hardwood called anigre, they treated them all with similar stains. “They have a different feel, but they still speak to one another,” says Cushing. Similarly, while the floor and the fireplace are both made from concrete, they have been given different finishes. The fireplace has a rough, textured feel, while the floors are polished and shiny. The gray palette balances all these different textures, much as the stain connects the various grains and patterns appearing in the wood. 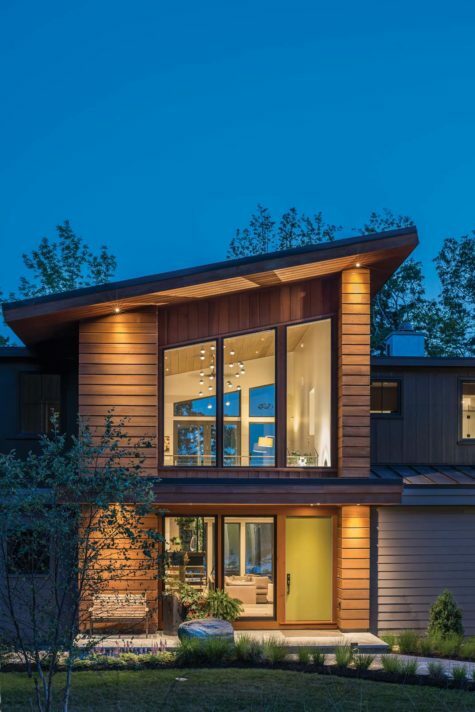 And although her husband and father expressed some concerns about placing a contemporary house back in these lush old woods, they now agree that it fits perfectly into the natural landscape. “It’s funny,” says the homeowner thoughtfully. “People will tell me that you can’t see it when you’re kayaking by or on the water. You don’t see the house until you get right up close. It nestles into the coastline.” The gray house speaks to the gray stone, and the cedar panels are, if you squint, almost exactly the same red as the pine needles. Should any little girl look out from her window across the bay and see these woods, she can still wonder: What’s over there in those wild trees? And if the light hits the windows just right, like it does at sunset when the windows gleam gold, she might just get her answer. 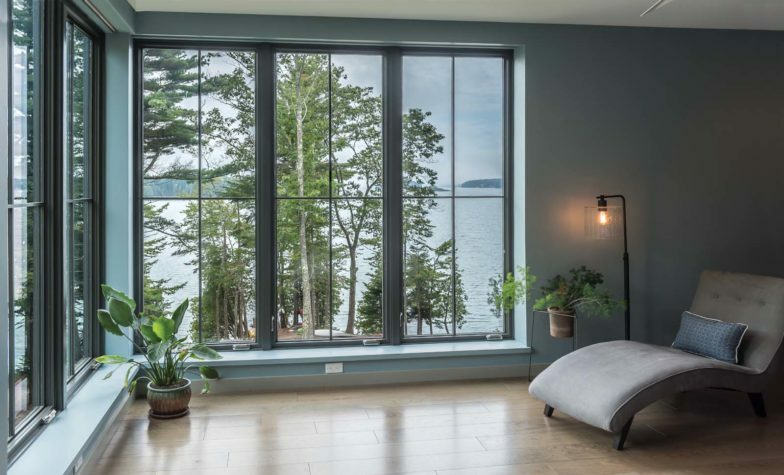 Designed and built by Knickerbocker Group, this contemporary house sits on a hill above the waters of midcoast Maine. 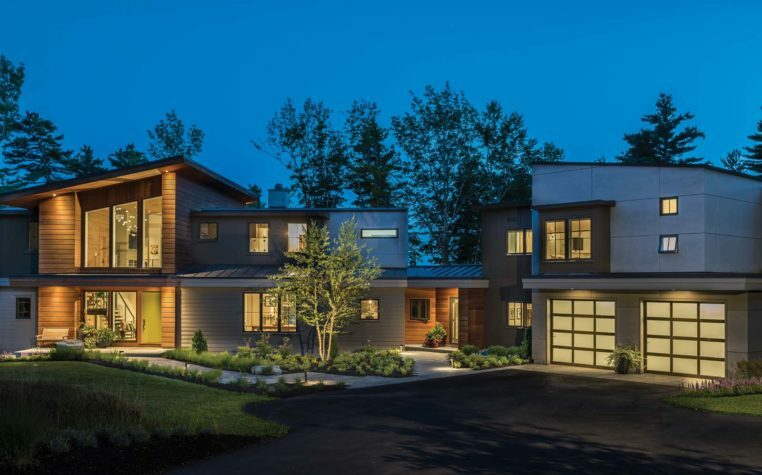 The home was built with multiple levels to conform to the land’s elevation changes. 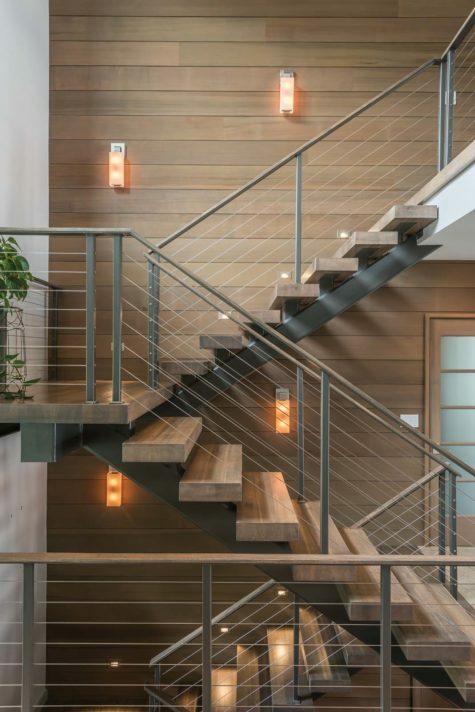 Located in the center of the house, this cantilevered staircase appears almost to float in midair.